The Knicks, more than anything else (more than stability, more than institutional consistency, more than winning), seem to have valued drama the most over the last year, so, we'll confess, it's a considerable surprise to see the team moving to give Mike Woodson a long-term deal, perhaps as early as this week. An extended, played-out-on-the-back-page courtship of Phil Jackson appeared inevitable. But, apparently, the Knicks never even reached out to Jackson in the first place; they're comfortable with Woodson in the long term. It's worth asking why. Well, okay, we know why: Woodson led the team to an 18-6 record in his time coaching the Knicks after Mike D'Antoni (who was 18-24 this season) resigned, and he won the team's first playoff game in eleven years. The team's defense transformed itself dramatically once Woodson took over, and one could argue that, if the Knicks had won one more game or two fewer games during D'Antoni's run, the Knicks could have avoided the Heat in the first round and might still be playing in the playoffs this very second. Woodson got along famously with his superstars and even seemed to inspire Carmelo Anthony to give a darn on defense — no small feat. In a normal environment, extending Woodson is an obvious decision; he turned the season around, a season that, had it ended without making the playoffs (the direction it was going in a post-Lin, D'Antoni-Anthony dysfunction neverland), would have been a fiasco of massive proportions. 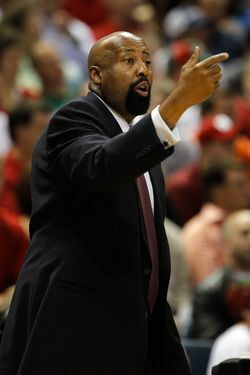 Woodson saved the 2011-12 season, and for that, he deserves all the credit in the world. He coached six years in Atlanta, and in five of them the offense was better than the defense. The lone exception was 2005-06, when the defense was 23rd but the offense an even more miserable 29th. The Hawks never finished in the top 10 in defensive efficiency, whereas Woodson's most spectacular coaching achievement came on offense with Atlanta's still-difficult-to-explain No. 3 finish in 2009-10. If I could boil down Woodson's defense in Atlanta to two words, it would be "switch everything." This was partly a response to personnel — with four starters between 6-foot-7 and 6-9 and two mobile bigs, it was easier to switch. We'll see how much this carries over to the much different roster in New York. Yeah, the switching defense was without question the weakest aspect of the Knicks' D last year, both under D'Antoni and Woodson. One can make a rather strong argument that the key to the defensive improvement when Woodson took over was less any sort of defensive wisdom and more "Carmelo Anthony finally deciding he'll play defense now that he likes the coach." (Or, "Tyson Chandler being healthier.") And let's not get into Woodson's offensive inflexibility he showed during the playoffs, in which he took his usually isolation-heavy offense and double-downed on it. It was Carmelo-on-five way too often, and it was regularly surprising how little interest Woodson had in making any adjustments. (We guarantee you D'Antoni would have figured out a way to get Steve Novak some shots, that's for damned sure.) Woodson is a likable guy who took over at just the right time, but if there's next-level coach acumen there, we haven't seen it. But that's not why Woodson's getting the extension; Woodson's getting the extension because he gets along with Carmelo Anthony — with his isolation offense, how couldn't he? — and because he fits into the MSG culture. Remember, this is a guy who had to fire his agent just to negotiate for the job. MSG is a CAA organization now (honestly, Carmelo runs this place), and Woodson reflects that. He will not raise a fuss like D'Antoni or Jeff Van Gundy, he won't mouth off to the media like Larry Brown, he isn't a complete and total disaster area like Isiah Thomas. So he might be the perfect coach for this organization. We're just not sure he's the perfect coach for this team. After all, his primary qualification — not his only one, just the primary one — is that Carmelo likes him and is willing to play hard for him. The obvious rejoinder to that, of course, is until he doesn't. Carmelo Anthony is the one running this team, really, so the most we can hope from a coach is to be able to draw up some great sets. We've yet to see if Woodson can do that. In that ESPN piece, Hollinger wrote, "The thing about interim coaches is that sometimes franchises get boxed into hiring them long-term even when they'd rather not, because the team suddenly plays better for the new guy." We think that's precisely what's happening here. This should keep the trains running on time at the Garden. But we're not sure it brings the Knicks any closer to a championship.